I met a friend in London last Friday night as we were getting a bus to Cardiff early Saturday morning. Short, bank holiday weekend away for some sight seeing and coffee drinking! I met her at a pub in Bayswater, and after a drink we decided to grab some food (by this stage it was 10pm and I was starving!) we agreed that China Town was a good stop on the way home, so we got the tube to Tottenham Court Road. As we walked up the road we came across a small cluster of Korean restaurants, most of which were shutting as it was now past 10 o’clock. We managed to score a seat in one called Assa, with quick friendly service and free vessels of iced tea on the table. The menu was not too big, with a range of pickles, small share plates, stir fried dishes, BBQ dishes and the Korean hotpot. I’m quite new too Korean food, I love Kimchi, and there’s a place I love eating at in Brighton that do an incredible Bimimbap, but that’s about as far as my knowledge goes. I saw the BBQ pork belly so knew I had to order that straight away. 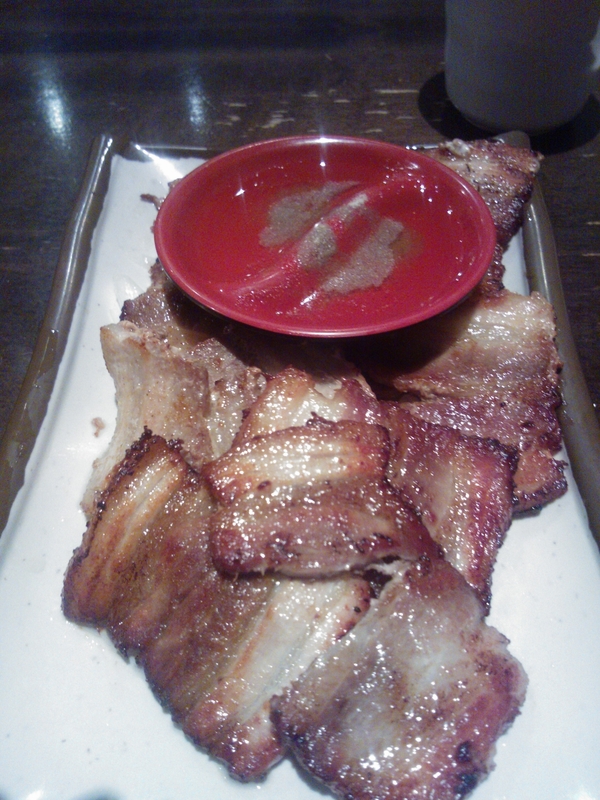 We also ordered kimchi, and Korean fried pork dumplings and asked the waiter for his recommendation. He directed us to the hot pot first, but didn’t really feel like that at the time (although it was only £22 per pot so I would definitely have to go back) and then suggested the marinated spicy beef. I’m all up for house recommendations so we went with that! 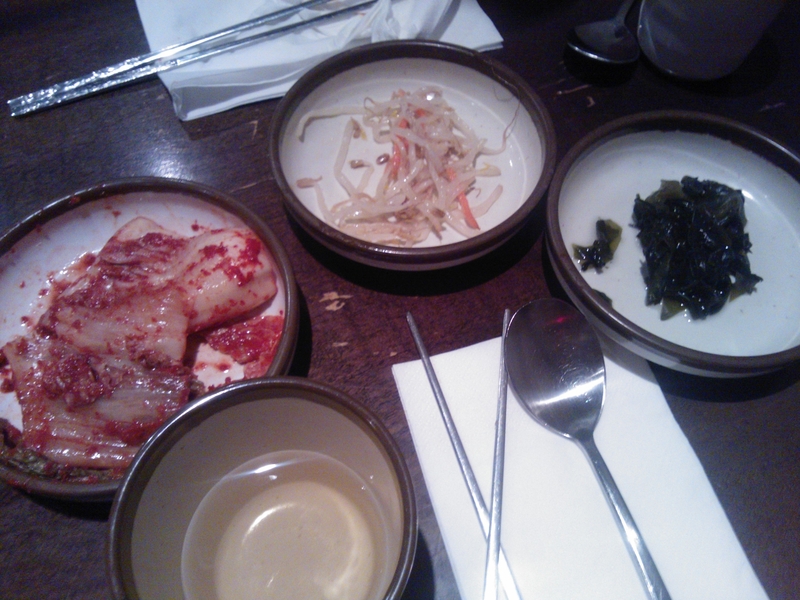 The kimchi came first, with a dish of beansprouts in sesame oil and a dish of pickled seaweed. The kimchi was packed with flavour and slightly fizzy on the tongue, and the beansprouts and seaweed were a good kick start for the taste buds for the food that was about to come. BBQ pork belly came second, served on a bed of raw white onions and smelling delicious. Maybe next time I would’ve ordered rice, and we didn’t have side plates either which I could’ve asked for but for some reason didn’t. The pork came with a vinegar and black pepper sauce, but I preferred eating it on its own with the onion to appreciate the natural BBQ flavour. 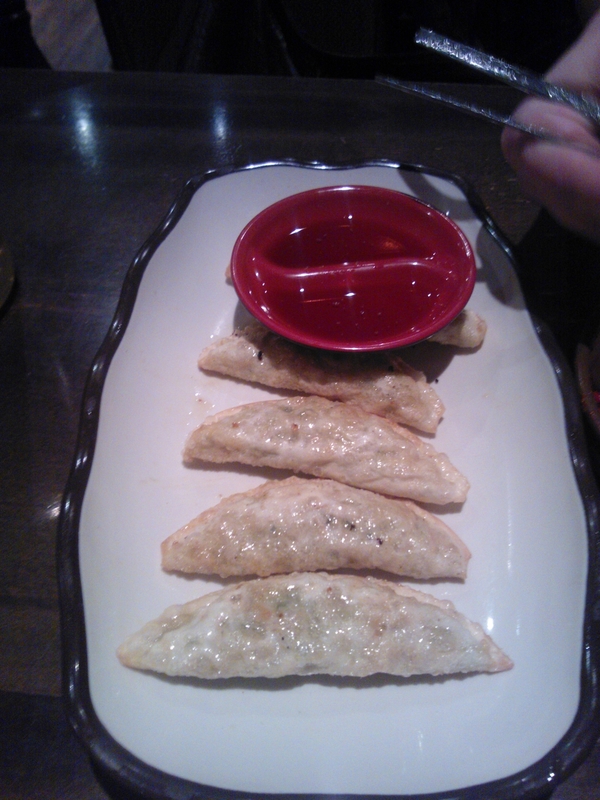 The dumplings were up next, these were similar to a gyoza, but in a slightly thicker dough, were lightly fried and came with a rice wine dipping sauce. They were full of spring onions, garlic and minced pork, perfect for post cider drinking. 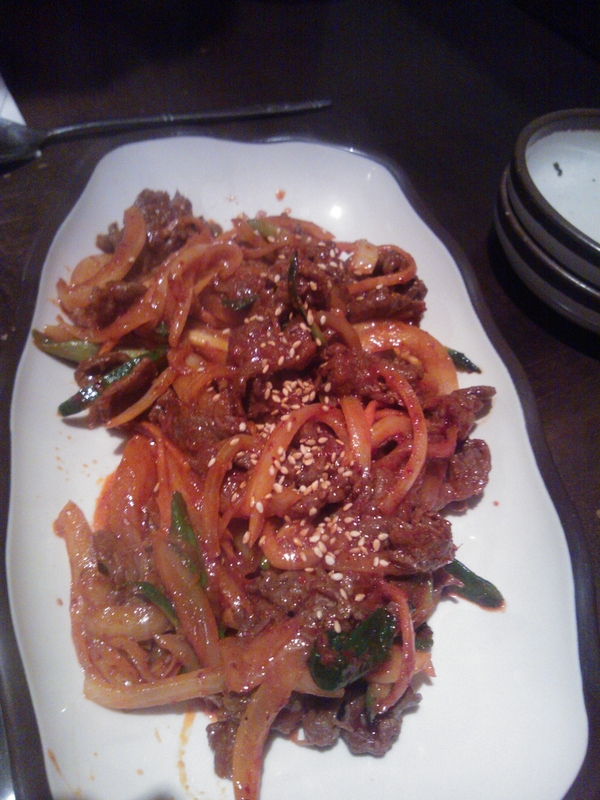 Last but definitely not the least was the marinated spicy beef. This was better than I was expecting! The beef was soft and tender, with loads of onions and peppers and just the right amount of sweetness and spice. I think this dish would’ve been good with steamed rice too, as it was quite rich. Our bill came to only £27 for all of that food, we didn’t order drinks, but as I said there was free iced tea on the table so why would you? I loved the metal chopsticks too, I’ve never seen them before and they were suprisingly easy to use! 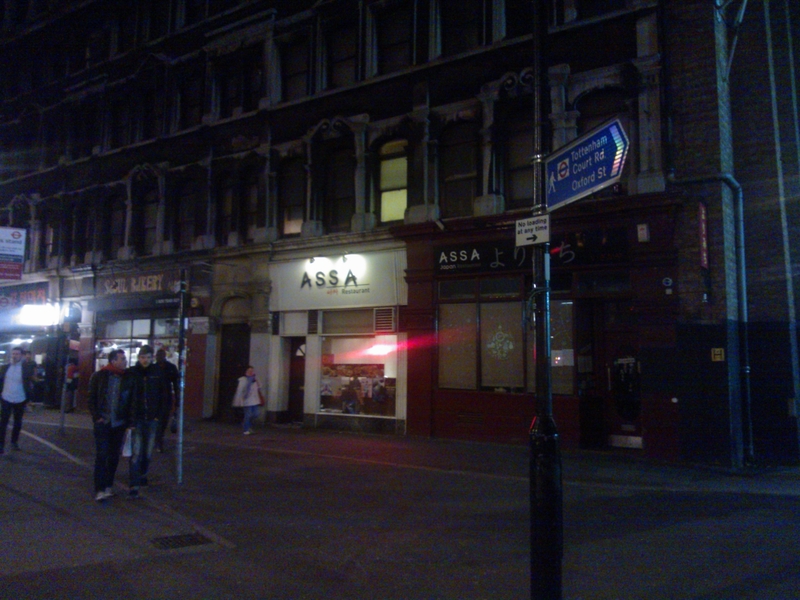 So, if you’re ever looking for somewhere to eat that’s quite central, cheap good service and down right delicious, I would highly recommend you make a trip to Assa – it’ll do you good.